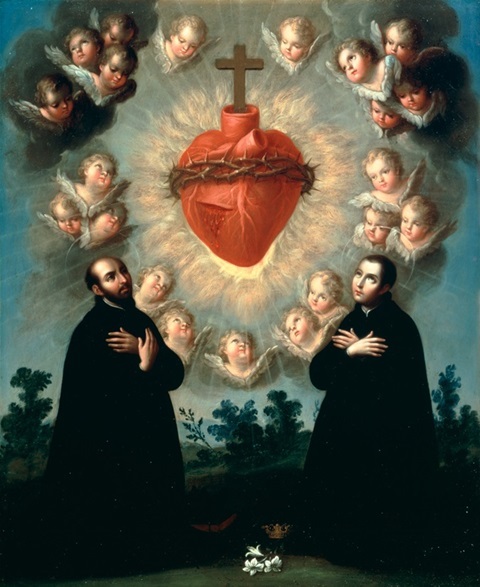 Click here, for how to fulfill the Nine First Fridays Devotion to the Sacred Heart. Heart of Jesus, infinitely holy and merciful Heart, I give myself to thee without reserve, and for ever. I abandon to thy care my present and my future; under thy protection, and for thy greater glory, I wish to commence, continue, and terminate all my actions. I confide to thy love every day of my life, and will repeat every morning, in union with the holy sacrifice of the mass, this filial consecration. Thy Heart, O Jesus, shall henceforth be my consolation. I will invoke it in my trials, in my difficulties, in my fears. Banish from my mind every desire, every resolution and action which is not conformable to thy holy will. Suffer me not to yield to temptation, preserve me in purity of heart; be thou to me a buckler against my own weakness every moment of my life, be thou my help in death, and my reward in eternity. Amen. Jesus, most charitable, Jesus, meek and humble of heart, forgive our sins, give thy peace to our souls, remember us in thy kingdom! Jesus, meek and humble of heart, render my heart like unto thine. O adorable heart of my Saviour Jesus, loving heart of my good master, how great is thy tenderness to have remained for me in the divine Eucharist! Alas, thy creatures forget thy love, despise thy complaints, and withdraw themselves from thee; forgetting that, in thy agony in the garden, thou didst endure all bitterness of our sins. We now again by our inequities renew thy sorrows. Thou languishes here with love and sadness, and how few think of thee, care for thee, or are touched by thy loneliness. Let me at least, sensible to thy sorrows, listen to thy tender complaint, for I desire to repair the outrages which are unceasingly directed against thee. Prostrate, annihilated in spirit before the holy tabernacle in which thou dost display thy love, I beseech thee to pardon my sins, and those of the whole world, for their contempt and indifference, their insults and their sacrilege. If I cannot wash away with my blood my own faults, and those of all thy guilty children, may I at least silently weep over the outrages of which thou art the victim. Oh that I could dispose of the hearts of all mankind, and fill them with regret and gratitude, in order to offer them to thy love as the only homage which it desires to receive. Lord Jesus, I offer myself as holocaust. Behold my heart, purify it, consume it with love, sacrifice it to thy will, that henceforth I may love thee only, and live only to love thee. Guard thou my heart, lest I should reclaim it, hide it in thy wounds as in a safe asylum, so that there I may live and die in order to be united to thee for ever. Amen! O most merciful Jesus, thou who art inflamed with so ardent a love for souls, I conjure thee by the agony of thy sacred heart, and by the dolours of thy immaculate mother, to purify in thy blood all sinners throughout the world who are now in their agony, and who will to-day depart this life. Agonising heart of Jesus, have mercy on the dying. June 1: St. Angela Merici Virgin, Double. June 2: FIRST FRIDAY/Commemoration of Ss. Marcellinus, Peter, and Erasmus Bishop, Martyrs. June 3: FIRST SATURDAY/Vigil of Whitsunday (Pentecost), Double [Fasting & Partial Abstinence]. June 4: Whit Sunday (Pentecost) with an octave, Double of the I Class. June 5: Whit Monday, Double. June 6: Whit Tuesday, Double. June 7: EMBER WEDNESDAY/Whit Wednesday, Double. June 8: Whit Thursday, Double. June 9: EMBER FRIDAY/Whit Friday, Double. June 10: EMBER SATURDAY/Whit Saturday, Double. June 11: Holy Trinity Sunday, Double of the I Class. June 13: St. Anthony of Padua Confessor, Double/Centenary of the 2nd Apparition at Fatima. June 15: Corpus Christi, Double of the I Class. June 18: II Sunday after Pentecost, Double. June 23: Sacred Heart of Jesus, Double of the I Class; Vigil of Nativity of St. John the Baptist. June 24: The Nativity of St. John the Baptist, Double of the I Class. June 25: III Sunday after Pentecost, Double. June 28: St. Irenaeus Bishop and Martyr, Double; Commemoration of the Vigil. Sweet Heart of Jesus, be thou my love.